Figure 1. A cross-section of the Dymaxion House illustrates the mast-hung double wire-wheel structure. Drawing courtesy of Henry Ford Museum & Greenfield Village. As the Dymaxion House has existed in various forms since 1945, determining the goal of the historic preservation work was a particular challenge. The conservation and reassembly of the building components is based on scholarly research from primary sources, mainly Fuller’s personal archive: the “Chronofile.”(6) However, the claims made by Fuller and others of the extraordinary features and attributes of the house have further complicated the interpretation of the Dymaxion House. The analysis of the archival materials and the examination of the house components themselves have revealed that the design development was cut short. (7) The house existed as a prototype or model home, rather than a mass production commodity. The engineering drawings prepared by Fuller Houses Inc. demonstrate that the design was developing rapidly between 1944 and 1946. There are drawings of multiple versions of the same component, some just months apart, which illustrate the rapid development of the design. The photographs taken at the Barwise factory and at the rural Danbury site reveal the subtle improvements from one prototype to the next. The correspondence sent by Fuller Houses Inc. to its suppliers reveals the urgency of the search for materials for the prototypes and for reliable sources for mass production. (8) Furthermore, amidst the museum’s collection of house components, there are parts of various Dymaxion house prototypes. The analysis of the collection of over 3,600 major parts revealed that, while there were extra parts, there were also parts missing, parts made obsolete, and parts that had been subsequently altered. Figure 2. As constructed by William Graham in 1948, the "Wichita House" was a hybrid version of the Dymaxion House. Photograph courtesy of the William Graham family and Henry Ford Museum & Greenfield Village. Some of the significance of the house is attributed to its authorship by R. Buckminster Fuller. While homeowner William Graham built his house in 1948 from Fuller’s prototypes, the “Wichita House” lacked the sophistication of the prototypes and it disappointed Fuller (Figure 2). (9) The museum chose the goal of its reassembly to be to the 1945-1946 period when the building is most closely associated with Buckminster Fuller. When considering each of the two prototypes from that period, we understand that the second prototype built outdoors was constructed mainly for testing purposes. As the first prototype was fitted with interior fixtures and furniture and thus the most complete, the museum has chosen to reassemble the collection of Dymaxion parts as closely as possible to the first prototype, the one constructed indoors. Yet as with virtually all such projects, the very act of conservation changes the original in some way. While the goal of the conservation and reassembly will be the 1945 indoor prototype, there was an ethical dilemma regarding the missing components. Even if the parts in the collection could be distinguished from one prototype or the next (which in many cases is not possible), analysis revealed that an assemblage consisting of only parts from one prototype would achieve neither structural independence nor aesthetic integrity. Rather than constructing a partial house, parts from the second prototype are installed where required to achieve a “whole” Dymaxion House. In addition to components from the first prototype, the house restored at the Henry Ford Museum will contain components from the second later prototype, parts from the Grahams’ Wichita House, and new components fabricated by the museum. This combination of parts poses both a challenge to interpreting the building and an opportunity to reveal the evolution of the design and the subsequent history of the house(s). Figure 3. Potential home buyers and a salesman, posing in front of the first complete prototype inside the factory, are featured on the cover of the Beech Aircraft employee newsletter of 22 March 1946. Photograph courtesy of Raytheon Corporation. While one may accept the notion that the Dymaxion House exists independently of a site, there is the issue of whether it belongs indoors or outdoors. Regarding long term preservation of the original building fabric, choosing to locate the prototype outdoors would have posed problems due to vulnerability to further deterioration. Fuller combined dissimilar metals for expediency during the prototyping phase and had no intention that the prototype would be exposed to the weather for many years. The advanced corrosion of components of the Graham’s Wichita House demonstrated the fragility of the prototype in an outdoor environment. Merely placing an aluminum object indoors reduces its corrosion rate by a factor of one thousand. (13) As the Dymaxion House shares many similarities with aircraft, and as aviation collections are often exhibited indoors to provide favorable environmental conditions, there exist precedents for exhibiting the structure indoors. Regarding the interpretation of the house based on historical accuracy, archival documents demonstrate that the two prototypes from late 1945 and early 1946 are the versions of the Dymaxion House most closely associated with the designer Fuller. Of these two prototypes, it is the first one that was most fully developed. It was built indoors, furnished as a model home, and professional models posed for photographs that were published in Life, Fortune, and other magazines (figure 3). One could argue that the location of the Dymaxion House inside the Henry Ford Museum as an exhibit is a sympathetic interpretation of Fuller’s most complete original prototype displayed inside the factory in Wichita. The decision to conserve and restore the building at an indoor site provides both favorable environmental conditions for the longevity of the historic artifact and an opportunity for an accurate and appropriate interpretation of the building. Figure 4. Prior to the disassembly of the house in 1992, the building was uninhabited and had become infested with raccoons and snakes. Photograph courtesy of the William Graham family and Henry Ford Museum & Greenfield Village. The building materials are either very specific to the construction industry at the end of World War II or they are aviation materials used in architectural applications. As such, these aged modern materials pose challenges for conservators. The materials include aluminum alloys, plastics, plywood, chromoly steel, stainless steel, and naugehyde among others. Due to age, exposure to environmental conditions, and abandonment of the house prior to its acquisition by the Henry Ford Museum, the deterioration of many of the materials was considerable (Figure 4). Figure 5. 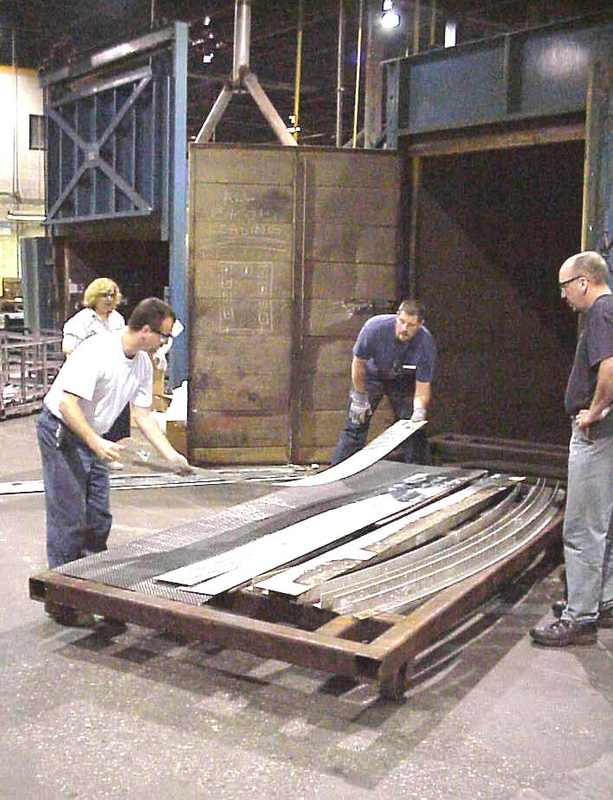 "Outer Z Ring" components, which constitute the building's floor structure, are racked in preparation for placement in a furnace which will heat treat them for improved corrosion resistance. Photograph courtesy of the William Graham family and Henry Ford Museum & Greenfield Village. Just as Fuller drew from the aviation world for his design of the Dymaxion House, the conservation of the prototype draws from the analytical tools and treatments developed by the aviation industry. Heat treating is the process by which an aluminum alloy is elevated to a high temperature, thereby changing its microstructure to improve performance. In heat treating these alloys, it is possible to move the copper ions away from grain boundaries, thus decreasing the opportunities for intergranular corrosion. (22) From the perspective of museum conservation, the heat treatment is considered irreversible as it causes subtle changes in the metallographic structure of the alloy. Although it may be considered irreversible, it is possible to change the structure of the alloy to its prior condition by inducing futher metallograpic changed by subsequent heat changes. In May 2000, the Henry Ford Museum commenced heat treating aluminum parts of the Dymaxion House(23) (Figure 5). It is understood that this was the first time the treatment was used by museum conservators to diminish opportunities for further deterioration of historic aluminum artifacts. The analytical tools and treatments developed for the conservation of the aluminum of the Dymaxion House may have direct implications for the conservation of other objects. These may include World War II aircraft collections or buildings constructed of the same materials such as Britain’s AIROH (Air Industries Research Organisation for Housing) houses. As an example of one of the challenges faced by conservators, the conservation of the aluminum of the Dymaxion House demonstrates the search for tools and treatments that lie outside the current boundaries of conservation science. “Art history finds it difficult to deal with a design like the Dymaxion house, which never really existed but is nonetheless a landmark in technological evolution.”(24) While this may suggest that the Dymaxion House is anomalous, it is really among a family of structures and artifacts from the modern era. It shares similarities (either physical or thematic) with house museums, model homes, exhibition pavilions, temporary structures, test models, aviation artifacts, and even Airstream trailers. Just as the Dymaxion House challenged the notion of “home” in the 1940s, the work at the Henry Ford Museum challenges preservation orthodoxy today. The conservation and restoration of the Dymaxion House at the museum raises important philosophical and technical issues, and these may have implications for the identification, evaluation, and conservation of other structures of the modern era. In 2002 the Henry Ford Museum undertook a Historic American Buildings Survey (HABS) documentation project that resulted in a number of measured drawings. These materials are available to the public through the HABS Collection at the Library of Congress. 1. Martin Pawley, Buckminster Fuller (London: Taplinger Publishing Company, 1990), 13–14. 2. Fuller’s 4D House of 1928 was described in this way: “The house is essentially a wire wheel turned on its side, with the hub extended to become the mast,” in Robert W. Marks, The Dymaxion World of Buckminster Fuller (New York: Reinhold Publishing Corporation, 1960), 85. 3. “Waldo Warren, one of Field’s marketing men, thought Fuller’s terms confusing [sic] unexciting and combined the words dynamic, maximum, and tension into the acronym Dymaxion,” in Christian W. Overland, The Dymaxion Dwelling Machine: R. Buckminster Fuller’s Dream of Mass Produced Housing (M.A. thesis, State University of New York at Oneonta, N.Y., 1998). 4. The Henry Ford Museum & Greenfield Village acquired the Dymaxion house (known as the Wichita House) and spare parts from the Graham family in 1991, and following documentation, it was disassembled and moved from Andover, Kansas, to Dearborn, Michigan in 1992. 5. The acquisition of the house, initial research, and documentation are discussed by Christian W. Overland in “Research and Restoration of Buckminster Fuller’s Dymaxion Dwelling Machine (a work in progress)” in Deborah Slaton and Rebecca A. Schiffer, eds. Preserving the Recent Past. (Washington, D.C.: Historic Preservation Education Foundation, 1995). 6. The Chronofile is located in the archives of the Buckminster Fuller Institute recently acquired by Stanford University at Palo Alto, California, and at the time of writing is in storage and inaccessible to researchers. 7. “We estimated that the house needed at least another year of development, “ Jay Baldwin, BuckyWorks: Buckminster Fuller’s Ideas for Today (New York: John Wiley & Sons, Inc. 1996), 56. 8. “I am sorry to tell you that failure to follow through on their promises by members of your company has caused the first crick in the back of our enterprise . . . . this kind of service can well spell disaster to us,” in Letter from R. Buckminster Fuller to Mr. David Reynolds of Reynolds Metals Co., 13 July 1945. 9. On the subject of the Graham house, Fuller is quoted as follows: “His architectural additions and modifications in effect . . . forever grounded this aeroplane” in Marks, 133. 10. Bob Beardsley, Wichita city preservation planner, is quoted as follows, “It would have been nice for the Dymaxion to have stayed in the Wichita area, but it boils down to money and expertise—and we have neither. Saving the building is more important than anything else,” in B. Tanner, “Futuristic Home to Leave Kansas Prairie for Museum” in Wichita (Kansas) Eagle, 24 January 1992, 6A. 11. Aspects of properties including both buildings and their exterior spaces are discussed in Kay D. Weeks and Anne E. Grimmer, The Secretary of the Interior’s Standards for the Treatment of Historic Properties with Illustrated Guidelines for Preserving, Rehabilitating, Restoring, and Reconstructing Historic Buildings (Washington D.C.: 1996). 12. The Aluminaire house and its independence from its site are discussed in J. Rosa, Albert Frey Architect (New York, Rizzoli, 1990), 28. 13. C. Adams and D. Hallam, “Finishes on Aluminium—A Conservation Perspective”, in David W. Grattan, ed., Saving the Twentieth Century: The Conservation of Modern Materials (Ottawa, Ontario: 1991), 283. 14. The aluminum alloys are identified as 2014 and 2024 in T.D. Burleigh, Procedures for Restoring Aluminum Components of the Dymaxion House (Murraysville, Pennsylvania: Burleigh Corrosion Consultants, 1995). 15. Galvanic or electrochemical corrosion is the basic reaction that characterizes chemical deterioration of aluminum. In electrochemical reactions with most other metals, ions from aluminum go into solution and travel to the more positively charged metal. 16. Also known as vermiform or worm-track corrosion, filiform is a type of crevice corrosion commonly occurring as random nonbranching white tunnels of corrosion products beneath thin surface coatings. 17. Also known as layer or lamellar corrosion, exfoliation corrosion is a type of selective subsurface attack that occurs in tunnels parallel to the surface of the metal and predominantly in relatively thin products with elongated grain structures. 18. Dr. Karen Trentelman, Draft Analytical Report: Buckminster Fuller’s Dymaxion House (Detroit: Conservation Services Laboratory of the Detroit Institute of Arts, 2000). 21. Analysis and recommendations were prepared by Metallurgical Engineer Donna Walker of Climax Research Services, Wixom, Michigan, in 1999 to 2000. 22. Intergranular corrosion is a form of selective attack occurring along grain boundaries, and it usually occurs when a metal is not homogeneous due to alloying or fabrication. 23. Heat treating was executed by B&W Heat Treating (1975) Limited of Kitchener, Ontario. Baldwin, J. BuckyWorks: Buckminster Fuller’s Ideas for Today. New York: John Wiley & Sons, Inc. 1996. Banham, Reyner. The Architecture of the Well-Tempered Environment. Chicago: University of Chicago Press, 1969, 96, 265–266. Corn, Joseph J. and Brian Horrigan. Yesterday’s Tomorrow: Past Visions of the American Future. New York: Summit Books, 1984, 67–69. Fleming, John, Hugh Honour, and Nikolaus Pevsner. The Penguin Dictionary of Architecture, 3rd ed. New York: Viking Penguin Inc., 1980. Frampton, Kenneth. Modern Architecture: A Critical History. New York: Oxford University Press, 1980. Fuller, R. Buckminster. Designing a New Industry. Wichita, Kansas: Fuller Research Institute, 1945. Fuller, R. Buckminster. Inventions: The Patented Works of Buckminster Fuller. New York: St. Martin’s Press, 1983. Giedion, Siegfried. Mechanization Takes Command: A Contribution to Anonymous History. New York: W.W. Norton and Company, 1969, 706–711. Jandl, H. Ward. Yesterday’s Houses of Tomorrow: Innovative American Homes, 1850–1950. Washington, D.C.: Preservation Press, 1991. Jencks, Charles. Modern Movements in Architecture. New York: Penguin Books, 1973, 212–213, 367, 390. Kelly, Burnham. The Prefabrication of Houses: A Study by the Albert Farwell Bemis Foundation of the Prefabrication Industry in the United States. Cambridge: M.I.T. Press, 1951. Krausse, Joachim, and Claude Lichtenstein, eds. Your Private Sky: R. Buckminster Fuller, the Art of Design Science. Baden, Switzerland: Lars Muller Publishers and Museum für Gestaltung Zürich, 1999. LeBlanc, Sydney. Whitney Guide to 20th Century American Architecture. New York: Watson-Guptill Publications, 1993, 77. Marks, Robert W. The Dymaxion World of Buckminster Fuller. New York: Reinhold Publishing Corporation, 1960. McHale, John. R. Buckminster Fuller. New York: Braziller, 1962. Nelson, George, and Henry Wright. Tomorrow’s House: A Complete Guide for the Home-Builder. New York: Simon & Schuster, cira 1945. Pawley, Martin. Buckminster Fuller. London: Taplinger Publishing Company, 1990. Sieden, Lloyd Steven. Buckminster Fuller’s Universe: An Appreciation. New York: Plenum Press, 1989. Snyder, Robert, ed. Buckminster Fuller: An Autographical Monologue/Scenario. New York: St. Martin’s Press, 1980. Sullivan, Barry James. Industrialization in the Building Industry. New York: Van Nostrand Reinhold Company, 1980, xi-xiii, 16–20. Ward, James, ed. The Artifacts of Buckminster Fuller. New York: Garland Publishing, vols. 1–2. “Built Like an Airplane,” The Beech Log. Wichita, Kansas: Beech Aircraft, 24 August 1945, 6–8. “The Fuller House,” The Beech Log. Wichita, Kansas: Beech Aircraft, 22 March 1946. “Dymaxion Depends Upon Precision,” The Beech Log. Wichita, Kansas: Beech Aircraft, 20 August 1945, 6–8. Fuller Houses Inc. The Fuller House. Wichita, Kansas, March 28, 1946. “Fuller House” Life, 1 April 1946, 73–74, 76. “Fuller’s House: It Has a Better Than Even Chance of Upsetting the Building Industry,” Fortune, April 1946, 167–176,179. Overland, Christian W. “Research and Restoration of Buckminster Fuller’s Dymaxion Dwelling Machine (a work in progress)” in Slaton, Deborah and Rebecca A. Schiffer, eds. Preserving the Recent Past. Washington, D.C.: Historic Preservation Education Foundation, 1995, IV-33 – IV-45. Rybczynski, Witold. “A Little House on the Prairie Goes to a Museum” New York Times, New York: 19 April 1992, 34. “What Became of the Fuller House,” Fortune 37, no. 5 (1948), 168. Ashby, James. The Conservation of Architectural Aluminium and its Alloys. M.A. dissertation, University of York, York, U.K.: 1998. Burleigh, T. David. Procedures for Restoring Aluminum Components of the Dymaxion House. Murraysville, Pennsylvania: Burleigh Corrosion Consultants, 1995. Overland, Christian W. The Dymaxion Dwelling Machine: R. Buckminster Fuller’s Dream of Mass Produced Housing. M.A. thesis, State University of New York at Oneonta, New York, 1998. Trentelman, Karen. Draft Analytical Report: Buckminster Fuller’s Dymaxion House. Detroit: Conservation Services Laboratory of the Detroit Institute of the Arts, 2000. Graham, William. Building of the Graham Home. Color home-movie filmstrip, 1948. Paramount News. Housing—Definitely the Newest! Distributed by Paramount News Library Archives, Sherman Grinberg Film Libraries Inc., New York: March 1946. This article originally appeared in Preserving the Recent Past II, published by HPEF and the National Park Service. The conference proceedings are available as a free digital download.